In a brief pause between my Mongo + Elasticsearch + MHN post series, I wanted to finally publish a post I’ve had in limbo for a bit (mainly due to contest rules). Recently, SANS offered their DFIR Monterey 2015 Network Forensics Challenge, with a really sick prize of an OnDemand course. These courses aren’t cheap, and this was a fun challenge. The challenge consisted of 6 questions that increased in difficulty. SANS provided the PCAPs and log files for analysis, and specific questions for each. Before continuing, I’d encourage you go check out other write ups by Eric Gershman, and da_667, who offer some great insight into their analysis methods. Eerily, we approached some of these the same way. Others I approached a bit differently, and wanted to share that here with other forensicators. Question 1: At what time (UTC, including year) did the portscanning activity from IP address 123.150.207.231 start? We can see that the system clock (CMOS device rtc0) was set to 11:07 UTC on Aug 29, 2013, when our log read Aug 29, 07:07. This puts us in the year 2013, with a clock that is four hours behind UTC. Daylight Savings is in effect during this time, so I believe we’re operating in EST5EDT; EDT giving us UTC-4:00. Question 2: What IP addresses were used by the system claiming the MAC Address 00:1f:f3:5a:77:9b? This is where, for me, the challenge starts to move into Wireshark. 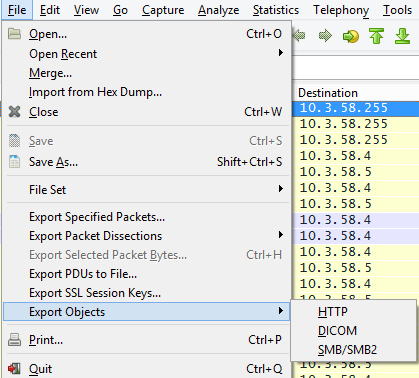 We’ll be back in the command line shortly, but I liked using Wireshark to visualize pcaps. Wow..7 packets. And all of interest. Including our duplicate IP warning! Quick Note: The 169.254.0.0/16 range is actually related to link-local IPv4 addresses that are used when DHCP cannot be contacted. As this traffic appears to come from Apple devices, here’s a link to Apple’s explanation on the topic. Question 3: What IP (source and destination) and TCP ports (source and destination) are used to transfer the “scenery-backgrounds-6.0.0–1.el6.noarch.rpm” file? It looks like four different RPMs were interacted with during this session. Our file of interest first appears, as you can see, in frame 5846. Immediately, we’ve got two IP addresses: 192.168.75.29 is our client, and 149.20.20.135 is our server. Ok, pause. This is where a bit of FTP understanding comes into play. The issuing of the PASV command tells the server to wait for the client (192.168.75.29 in this case) to establish the data connection. The server, in response, says "OK, I'm waiting. By the way, here's what you'll need for that transmision: (149,20,20,135,119,8)". The argument is a HOST-PORT specification for the data port to be used in data connection. There are defaults for both the user and server data ports, and under normal circumstances this command and its reply are not needed. If this command is used, the argument is the concatenation of a 32-bit internet host address and a 16-bit TCP port address. This address information is broken into 8-bit fields and the value of each field is transmitted as a decimal number (in character string representation). The fields are separated by commas. where h1 is the high order 8 bits of the internet host address. Well, these obviously aren’t our ports. Google time. I quickly found an interesting calculation post on stackoverflow, which briefly explains that to get the port calculation, perform p1 * 256 + p2. Looking back at the RFC, this is one of those "duh" moments - 8-bit fields and all. Duh. Substituting in our numbers, this gives us 119*256+8 = 30472. With our calculations in hand, let's look at this a different way. This was a fun question! Question 4: How many IP addresses attempted to connect to destination IP address 63.141.241.10 on the default SSH port? Evidence Type: Netflow. A text file is also provided that is the data in “long” output format. First, the -w flag filters only on exact matches. No more port 2222, 2202, etc. Second, Just give me column 5 — the source IP (indirectly, this gives me 63.141.240.10 as the destination). Third, separate the IP from the port with a cut statement. Finally, sort and unique. Your numbers will be off if you don’t sort. Nice! Now, in simplicity form, just throw a wc -l pipe at the end, and we've got a total of 49 IP addresses. 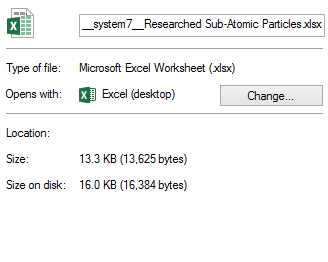 So, our file is 13,625 bytes in size. 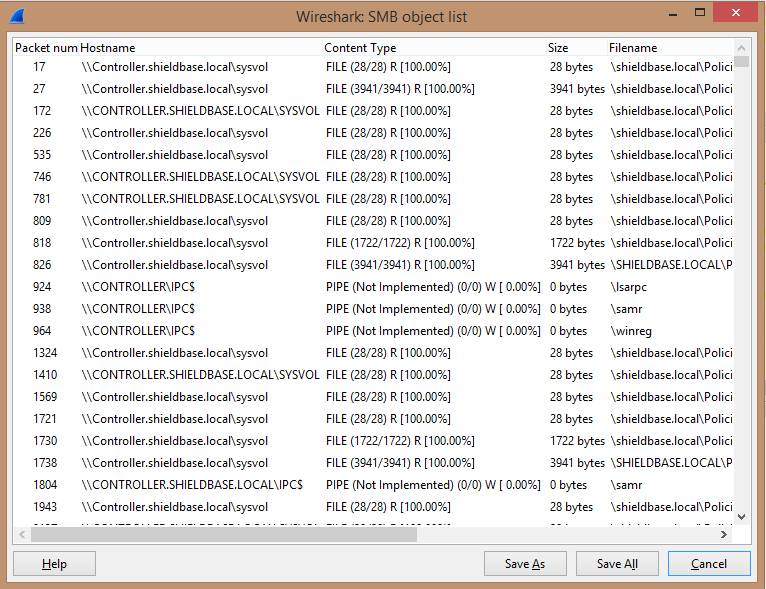 Now, if you look back at the Wireshark SMB/SMB2 screenshot above, you’ll see that we had the data 13625 along with the file name. Well, that was quick! Question 6: The traffic in this Snort IDS pcap log contains traffic that is suspected to be a malware beaconing. Identify the substring and offset for a common substring that would support a unique Indicator of Compromise for this activity. Bonus: Identifying the meaning of the bytes that precede the substring above. Three separate data fields, but something looks familiar: ULQENP2 is consistent across all of our fields. This is going to be hard to describe, but if you look at all 59 packets in this filter, and just scroll down, this frame of text appears to "stay static" while all other data around it changes. It's a weird way to describe something, but I think we've found a pattern. You can take the same method and expand it to the entire PCAP, and that particular string remains static. To answer the question correctly, our substring of interest begins at offset 0x46, is 7 bytes in length, and ends at offset 0x4C. The hex variant of our string is 554C51454E5032. Well, what do you know. Does this match up with our packet information? So, to answer the bonus, it appears that the four bytes preceding the IOC substring are a timestamp of the beacon. A big thank you to SANS for putting on challenges like this. It’s not everyday forensicators run into challenges like this on a daily basis, but bringing so many questions, protocols, and methods of analysis together is a lot of fun, and helps keep everyone fresh. I approached each question in a fun way, and would love to get some feedback from others as there’s never one way to approach a problem. I’m still not certain any of the answers are correct! I’ve also got the data set still, if anyone would like to go back after the fact and try the challenge themselves. Originally published at www.505forensics.com on February 5, 2015. You don’t know my mind, You don’t know my kind. Digital forensics is part of my design.